Avg. Group Discount of 65.2%! Night life attractions, restaurants and shopping centers and golf course nearby, Cancun downtown 5 minutes driving distance, Panoramic Tower, Embarcadero, Cancun Theatre. Occidental Costa Cancún, is a 4 star hotel by the beach.The hotel has 95 standard rooms,65 Studio (equipped with kitchennette)6 Jr. Suites,6 Pent House(a two bedroom apartment)All units have a private terrace or balcony, overlooking the Caribbean Sea.A modern construction of 6 floors, located on the beach,30 minutes from the Cancun International Airport, 5 minutes bus ride to downtown and walking distance to a small shopping mall and bars, discotheque.Facilities: swimming pool,open air terrace with two secret jacuzzi,miniature golf,children playgroung area,2 restaurantes,snack bar, swim up bar and night and day activities. Family ambiance tranquil and private. Earth Check; Crystal Certification, Distintivo "H" Certification. Cancun International Airport, at 20 Km. south to the Hotel.One way taxi expense $60.00 US per person. 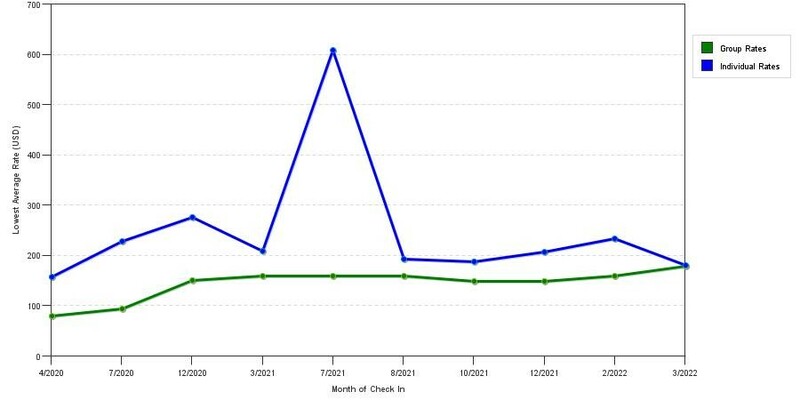 The chart above shows fluctuations of prices for both our group quotes and the best individual traveler prices our rate checker could find at the time the group offer was entered. The best group or meeting displayed is 79.9% in the month of July 2017 and the highest average individual rate is $641 in the month of April 2017. This chart will show past seasonality and also project future months. If you are flexible with dates, you may want to consider staying at Occidental Costa Cancun All Inclusive in a month when rates are lower. 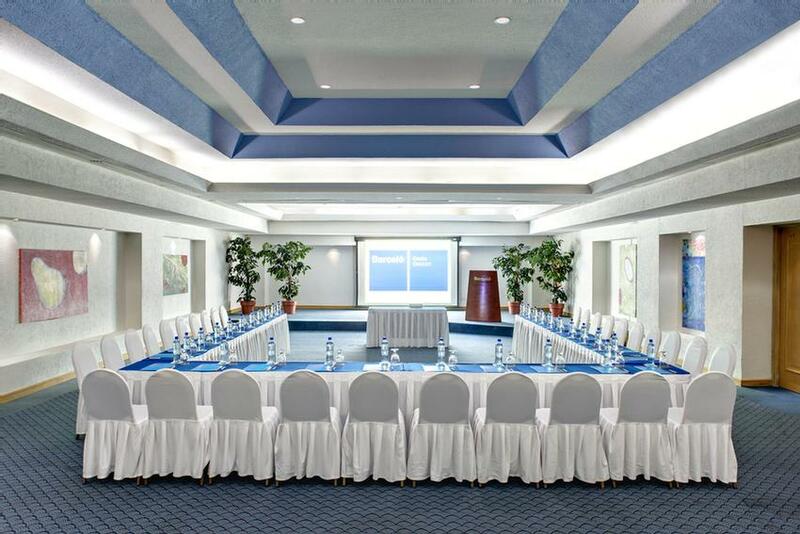 Below are the meeting, banquet, conference and event spaces at Occidental Costa Cancun All Inclusive. Feel free to use the Occidental Costa Cancun All Inclusive meeting space capacities chart below to help in your event planning. 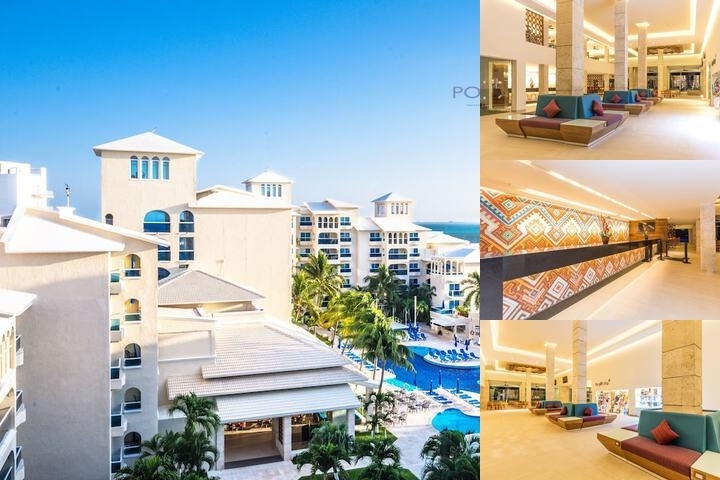 Hotel Planner specializes in Cancun event planning for sleeping rooms and meeting space for corporate events, weddings, parties, conventions, negotiated rates and trade shows. 77 x 29 x 8 Ft.